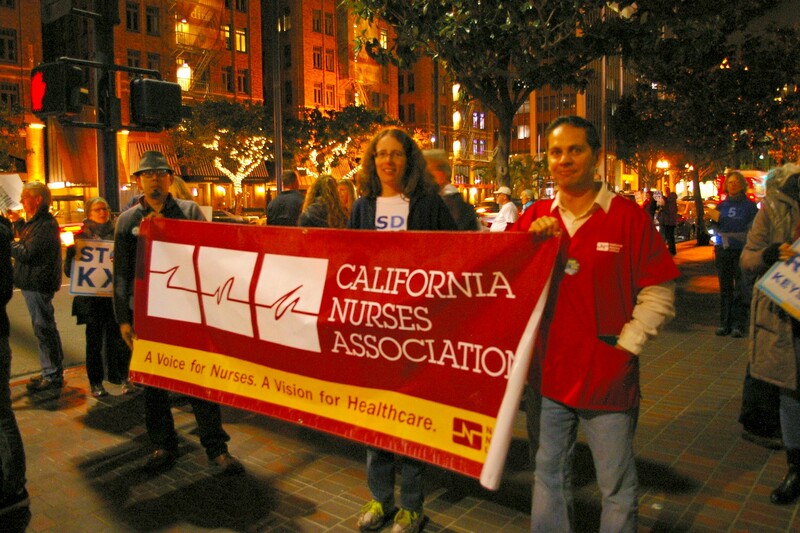 Masada Disenhouse co-founded SanDiego350 in 2011 and serves as its Executive Director. She is passionate about engaging volunteers and growing a powerful climate change movement. Ocean Agency / XL Catlin Seaview Survey / Richard Vevers. (photo links to license). The first week of winter quarter, I was sitting with Erica Ferrer, a doctoral student in Marine Biology at the Scripps Institute of Oceanography, in Muir Woods Coffee House. We had met to talk about the dire situation facing life on planet Earth and what we, as graduate students at UC San Diego, could possibly do about it. Predictably, I heard myself going off on one of my well-rehearsed climate rants. 25 percent of ocean species directly rely on tropical reefs. 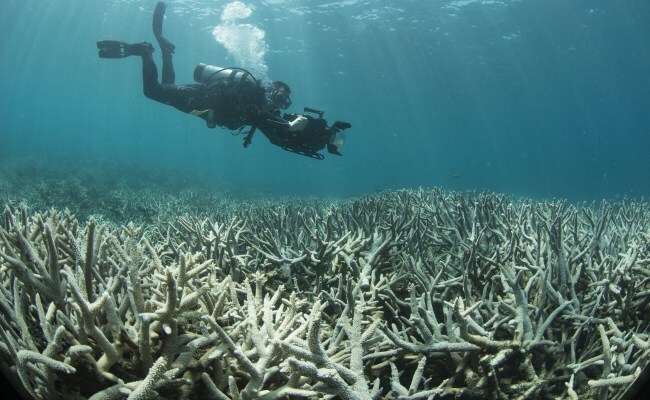 The United Nations Intergovernmental Panel on Climate Change (IPCC) 2018 Special Report indicates up to 90 percent of reefs will die at 1.5 degrees Celsius warming. We’re headed for 4 degreesby 2100. And so on. I regretted my aggressive tone as I heard Erica’s voice twist in her reply. There were tears in her eyes but she didn’t look away. It’s 2019, and the climate conversation has changed. Young people coming into our political own today recognize that the political elites of previous generations wasted their opportunity to prevent catastrophic global warming, leaving us forever picking up the pieces of a breaking world. But we also know it’s never too late to impact the future. Young people, especially young women, are leading the climate movement on every front. Gen-Z’ers are walking out of school on both sides of the Atlantic, led by figures like Greta Thunberg in Sweden, Anna Taylor in the United Kingdom, and Alexandria Villasenor in the United States. The plaintiffs in Juliana v. United States, all under 21 years old at the time of the filing, continue to press their case against the federal government for failing to protect them from catastrophic climate change. And Rep. Alexandria Ocasio-Cortez (D-NY 14th District), the working-class millennial, socialist of color, and youngest woman ever elected to the U.S. Congress, has introduced legislation advancing the Green New Deal, a plan to fully phase out fossil fuels from the United States economy by 2030. The plan pulls public support as high as 80 percent and has become an overnight litmus test for 2020 Democratic presidential contenders. Crucial to Ocasio-Cortez’s breakthrough in Congress has been outside pressure from the grassroots, millennial-led Sunrise Movement. Coming of age under neoliberal capitalism, an ideology that boasts the dubious accomplishments of driving historic inequality and utterly degrading the living world, Millennials and Generation Z have listened to a young lifetime of empty talk about “our children’s future.” But now our voices are leading the conversation. The future has arrived. We are the children. In Muir Woods that morning, Erica and I mostly talked about our feelings. It hasn’t been easy lately. I told her I was angry. She told me she was bitter. I told her I was depressed. She told me she was too. We took time to make space for our grief, our fear, even our despair. But we also talked about hope, and how it’s different from optimism. These days, that spaciousness of uncertainty is so wide, it can feel overwhelming. Events of the coming decade will determine the climate future for countless generations to come. When every minute matters that much, the question of what to do each day feels very heavy. The only thing that lifts that weight for me is remembering that I’m not alone. On climate, none of us have to do everything, but we all can do more than nothing. That’s why, as Graduate Student Association (GSA) representatives, Erica and I have founded a GSA Climate Action and Policy Committee, or GSA-CAP (as in, “cap emissions”), which any UCSD graduate student can join. Our mission is to strategically pressure the administration to achieve ambitious goals like the full decarbonization of campus operations as quickly as possible. Undergraduates who want to act on climate can plug into the California Public Interest Research Group’s legislative campaign to decarbonize transportation statewide. Off campus, San Diego 350 has initiated a nonviolent direct action campaign to “Raise the Alarm” and pressure elected officials to champion the Green New Deal. You can learn more and help plan the actions by attending the kickoff event this Saturday, February 23, in La Jolla. 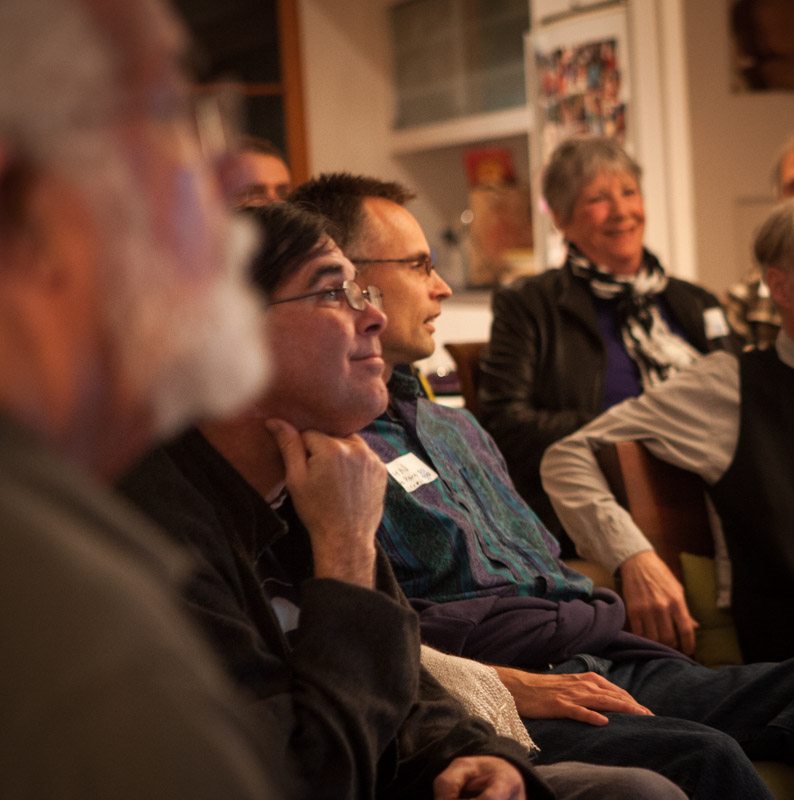 Every day, more people find their place in the climate movement. Every day, more people find that we can do more than nothing. Every day, more people ask themselves, what can we do next, that we haven’t tried before? Erica and I finished our coffees and headed over to Scripps. I apologized to my friend as we walked towards the shore. Erica nodded patiently. “To feel gaslit is a dangerous thing,” she said. Millennials and Generation Z care too much to stay politically silenced on climate any longer. We are waging the fight of our lives—a fight for the future of life on planet Earth—in our schools and workplaces, in the courts, in the media, in the institutions, in the streets, and in the halls of power. There are tears in our eyes, but we aren’t looking away. We are turning our grief into hope. Our strength, solidarity, and moral authority in this fight are grounded in our shared sense of loss. And that is why I believe that we will win. Peter Sloan is a PhD student in music and a staff writer for The Triton. This piece is the third part of a series titled Fire Season, which publishes once or twice per quarter. Peter can be contacted at psloan@ucsd.edu. This piece was first published at The Triton, an independent news source at UC San Diego. Follow The Triton on Twitter and Facebook. Here’s the original link. We know climate change is a serious threat, as do 81% of Californians, according to a poll by the Public Policy Institute of California. 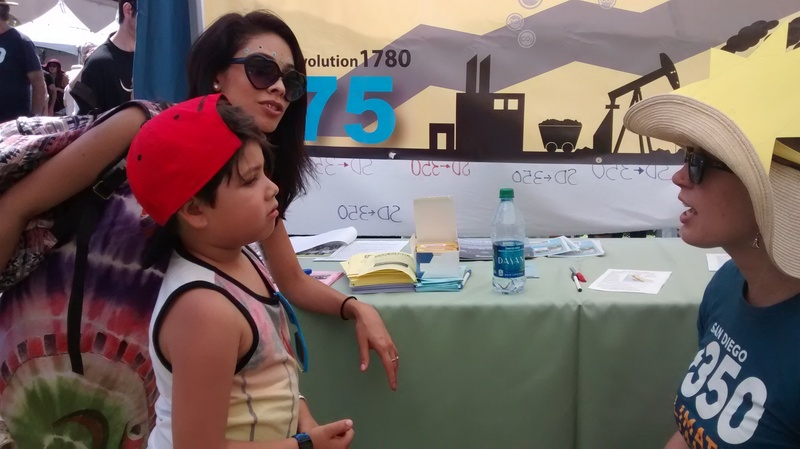 Thanks to the dedication and commitment of SD350 volunteers, we took climate action to Sacramento this summer. As members of the SanDiego350 Public Policy Team, we work to educate our members and the public, lobby officials and create a healthier climate future. In addition to advocating for improved climate laws at the local level, we also review state legislative bills related to climate change and advocate for their passage or defeat. This year we focused on eight priority bills. We educated ourselves and members of SanDiego350, posting our positions on social media, making making calls to legislators, and lobbying key San Diego Assemblymembers to urge them to vote for our priority bills. We are happy to report that 50% of the priority bills we supported were passed by the legislature and have been signed into law by the governor, including SB 32, a two-year bill we also supported in 2015, which cements California’s place at the forefront of climate action by codifying the state’s ambitious emission reduction targets into law. 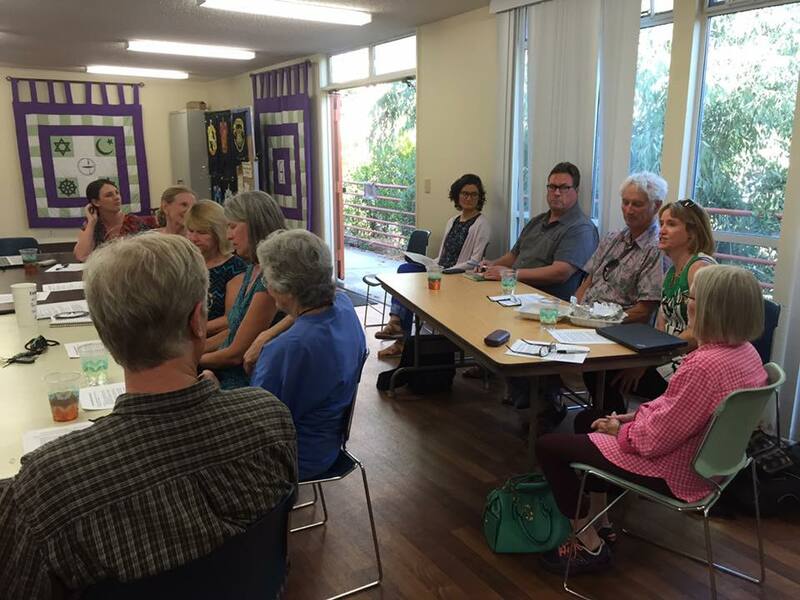 The SanDiego350 Public Policy Team decided early in the year to focus on identifying and prioritizing state bills that would reduce air pollution and greenhouse gas emissions and to train SanDiego350 members on advocating for legislation with elected officials. Members of our team identified relevant bills, prioritized the eight we felt were most important, and tracked the progress of these bills over the course of the legislative session. 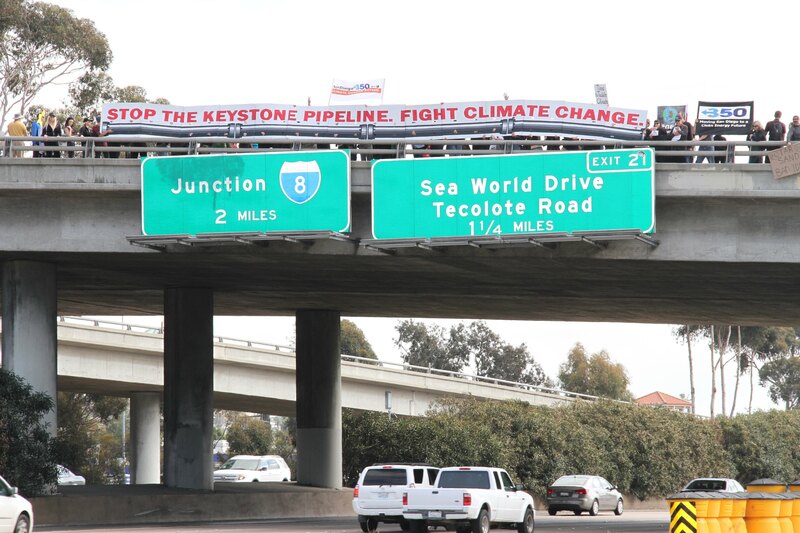 SAN DIEGO, CA – In San Diego and across the nation today, citizens concerned about climate change applauded as President Barack Obama vetoed legislation that would have forced him to approve the Keystone XL Pipeline (KXL). SanDiego350 (SD350), an all-volunteer climate action group, called the presidential veto a battle won in the fight against KXL, but noted that it does not stop the pipeline’s construction. The pipeline would cross an international border, so its ultimate approval rests with the President. SD350 is urging the President to take this last crucial step. President Obama has promised to disapprove construction of the KXL if it would make climate change significantly worse. Federal agencies and top scientists agree that it would. The 800,000 barrels of crude oil to be transported daily through KXL will be extracted from the tar-sands of Alberta, Canada. Oil extracted from tar sands crude causes 17% to 22% more carbon dioxide (CO2) emissions than does oil produced from conventional crude oil. The destination of this particularly dirty crude is the refineries on the U.S. Gulf Coast, from where most of it would subsequently be exported. According to climate scientists, we must keep global warming at or below 2° Celsius (or 3.6° Fahrenheit) to avoid the worst impacts. They estimate that, to stay within that limit, humanity must burn no more than 565 gigatons of carbon by 2050. Globally, it is estimated that five times that amount exists in oil, coal and gas reserves, meaning that 80% of these reserves would thus need to be left in the ground to keep global warming within the range recommended by climate scientists. SD350 argues that the extra emissions associated with tar sands crude oil production make the case for leaving it in the ground even stronger. 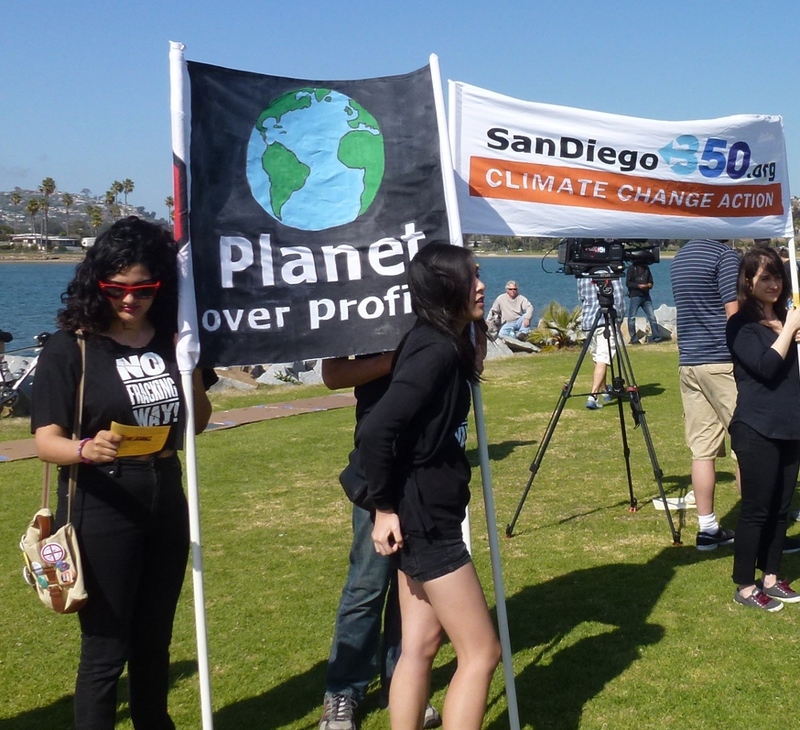 SanDiego350 and its partners have actively opposed the Keystone pipeline since early 2013, with rallies and “pipeline walks” in Mission Bay, Mission Beach, Balboa Park, La Jolla, downtown San Diego and even at Comic-Con. They stand against the endless mining of fossil fuels and for an expedited transition to clean energy. The time is now, they believe, for the President finally to reject KXL outright. SanDiego350, an all-volunteer, non-profit organization, is concerned about climate change and its very real effects on our livelihoods, well-being, and the future for our children. We work to increase awareness of climate change and advocate for reducing greenhouse gas emissions. We are loosely affiliated with 350.org, the international climate organization, whose work inspires us. On Saturday, June 21st over 100 San Diego County residents participated in the “Community Choice Energy Forum” put on by Friends of San Diego Clean Energy, a coalition that includes SanDiego350, Sierra Club San Diego, and the San Diego chapter of CalSEIA (the California Solar Energy Industries Association). The forum was kicked off by clean energy champion and San Diego City Council President Todd Gloria, who spoke enthusiastically about ramping up renewable energy and moving forward with a strong climate action plan. Supportive Comments were also made by Solana Beach Councilman Peter Zahn, Del Mar Councilman Don Mosier, and Chris Ward, District Director for State Senator Marty Block. SanDiego350’s Bob Braaton gave a heart-felt reflection about why we were there and our task at hand. Read more about Community Choice Energy and email us to find out how you can help bring it to San Diego. Masada Disenhouse fields many phone calls from San Diegans wanting to know more about SanDiego350, but an especially welcome call came from Paul Amato of the Patagonia store in Cardiff back in January. Paul indicated that their foundation, which gives grants to local, grassroots, non-profit organizations doing environmental work, had some funds left at the end of the year and they might be interested in supporting us! Masada described many of the areas we work with, emphasizing our anti-fracking project which he had mentioned seeing on our website. Masada described our all-out fracking campaign that includes public education, empowering people to speak up to their elected officials, op-eds & letters to the editor, and educating decision makers and elected officials. She also spoke to the fact that we are an all volunteer group getting a lot done, with each campaign bringing in additional new people, developing grassroots leaders, and growing the organization. Moreover, Masada effectively made the case that fracking is really key right now. SB4 passed, studying and regulating, but not stopping the practice. A new bill (SB 1132) seeks to expand the impact studies SB4 calls for, along with imposition of a moratorium until those studies are completed and adequate safeguards are in place. Work is needed to lobby the legislature for its passage. She explained that we see fracking as a key issue because extracting that oil and gas will exacerbate climate change, in addition to jeopardizing our drinking water supply through huge consumption of water along with possible ground water contamination. Masada highlighted how we were the only group working on this in San Diego County, emphasizing that we were connected with groups around the state on legislative strategy, public outreach and education, and pressuring the governor. The team immediately got in gear. Peg Mitchell, the fracking campaign lead, after first speaking further with Paul, completed the four page form on their website that summarized the organization and the planned activities in the fracking campaign that the grant would fund. Based on that, Masada fleshed out the budgetary aspects while Peg authored the full grant application. Nicole Peill-Moelter, Emily Weir and Masada provided editing and additional input and within less than two weeks the full application was submitted. The result? A short time later Paul notified us that we would be awarded a $5,000 grant for our fracking campaign! By the time Peg picked up the check, plans were already well underway for how to use it, starting with offsetting some (not all) of the expenses related to chartering the bus and acquiring T-shirts for the March 15 “Don’t Frack California” rally in Sacramento. One issue that the team discussed before deciding to proceed was whether to accept funding from a corporation. But this isn’t your typical “corporation” – in fact, it’s the kind of company that we are proud to be associated with as they not only share the same ideals we do, but they “walk the talk”. For example, during the “Black Friday” Thanksgiving day weekend when many other stores were making employees work the holiday itself or obscene middle of the night hours, they actually closed the store on Black Friday to give their staff the day off. They periodically have “field days” where the store is closed so employees can take time to try out the products they sell while at the beach surfing! But more importantly, they are an ecologically conscious ethical corporation who is a great role model for how business can be conducted without sacrificing the environment or ignoring the needs and rights of employees. You can read more about their vision of Corporate Responsibility. So here’s your chance to get involved! With funding in hand we will now proceed full steam ahead to engage the public. We will create more public education materials, banners and signs for use at tabling and fairs, starting with the April 27th Earth Day Fair in Balboa Park. Additionally we will continue to engage with the legislature as SB 1132 moves it way through the Senate and hopefully the Assembly. Finally we will be front and center at a public hearing with Dave Roberts on April 21st on fracking (Info/RSVP), with the goal of educating the Board of Supervisors and the public on the water related issues. SanDiego350 wishes to thank Patagonia for their consideration and appreciation of our activities. We are proud to partner with a company that embraces and shares our ideals for a clean, livable planet for our kids and future generations. To join our fracking team contact Peg Mitchell. This text by Peg Mitchell is used here by permission of the author, and is licensed under a Creative Commons Attribution-NonCommercial-ShareAlike 3.0 Unported License. The State Department’s 30 day comment period for the Final Environmental Impact Statement (FEIS) for the Keystone XL pipeline is underway and will end on March 7, 2014. That will bring us another step closer to the President making a final decision. Amazingly, the FEIS stated that there will be no significant environmental impact if the pipeline is built, which is simply put – unacceptable. The report essentially sidesteps the question of climate impacts by stating that the tar sands would be developed one way or another. Read more about the flawed FEIS at DesmogBlog. 350.org response: During the State of the Union, President Obama said he wanted to be able to look into the eyes of his children’s children and say he did everything he could to confront the climate crisis. How exactly does he plan on explaining to his grandchildren how building a 800,000 barrel a day tar sands pipeline like Keystone XL helped solve climate change? The twisted logic in the State Department’s environmental assessment might provide some political cover in DC, but it will be small comfort for future generations who have the bear the impacts of the climate crisis. We need to FLOOD the State Department with our comments, and make sure that Secretary Kerry & President Obama hear us! TAKE ACTION: Submit your comments at the State Dept Website: http://www.regulations.gov/#!submitComment;D=DOS-2014-0003-0001 by March 7, 2014. You can also submit comments via 350.org. Please feel free to use the talking points below, or to write your own. Either way, make sure you GET ON RECORD as another person opposing the Keystone Pipeline. KEY POINT: The Keystone Pipeline is not in our National Interest. The Keystone XL Pipeline is dangerous, dirty, and destructive. America’s best climate scientists have said that the pipeline will lead to a substantial increase in carbon emissions, as well as threaten America’s credibility as a climate leader. The pipeline’s risk to water has not changed at all with the new route. It still crosses the Sandhills and the Ogallala aquifer, and this was the reason that Gov. Heineman, Sen. Johanns and President Obama rejected the route the first time around. Probably the friendliest commissioner on California’s Public Utilities Commission which makes decisions on energy requirements and what kinds of energy we use in California, announced this week he is leaving the PUC because of his battle with cancer. He issued a parting statement that is powerful in calling on the rest of the CPUC to buck the utilities and push for renewable, distributed energy. It’s short, worth reading. I am sorry you must leave the CPUC for health reasons and wish you a full recovery. I wanted to thank you for your forward-looking record as a commissioner and for your public parting statement calling on the CPUC to be vigilant in not letting the utilities obstruct California’s goals for clean energy, a green economy, and addressing climate change. As an activist in San Diego County I will try to use your statement effectively. I hope the Governor appoints a worthy successor. Good luck and thank you again. 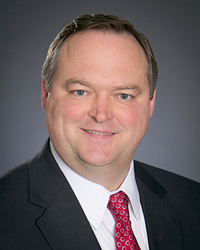 I was saddened to see Commissioner Mark Ferron resign from the CPUC this week due to his health. He was a great appointment by you, and his parting statement was spot on in highlighting the CPUC’s responsibility to navigate California to meet its clean energy and climate change goals even as the utilities battle to maintain their fossil fuel monopolies and “strangle” rooftop solar. As the CPUC considers replacement energy for the shutdown San Onofre plant, the timing could not be more crucial to have a strong voice for a clean energy future on that commission. I urge you to honor Commissioner Ferron’s service and commitment – and your own stated commitment to addressing climate change – by appointing a worthy successor to his position. Nothing would honor him more than appointing a commissioner to carry on his vision for advancing clean energy and climate solutions who would replace Mr. Peevey as the President of the CPUC. Thank you for your consideration. 1. First, there is no better place to be than California when it comes to energy and climate policy. We all know that there is no real Federal energy or climate policy, thanks in large part to the obstructionists in the Republican Tea Party and their allies in the fossil fuel industry. But in California, we have a clear commitment to green-house gas reductions and are taking bold and exciting steps in advancing renewables, energy storage and Electric Vehicles. (Parenthetically, I do believe that California has lost pace with the best in terms of Energy Efficiency and Demand Response.) We are at an inflection point where the convergence of new technologies, changing economics and, I hope, an added urgency to address our deteriorating climate, will combine to create exciting new business and policy opportunities. 4. Fortunately, or maybe unfortunately, with the passage of AB327, the thorny issue of Net Energy Metering and rate design has been given over to the CPUC. But recognize that this is a poisoned chalice: the Commission will come under intense pressure to use this authority to protect the interest of the utilities over those of consumers and potential self-generators, all in the name of addressing exaggerated concerns about grid stability, cost and fairness. You – my fellow Commissioners – all must be bold and forthright in defending and strengthening our state’s commitment to clean and distributed energy generation. Speaking at the San Diego rally, Mayor Bob Filner expressed his concerns about Keystone, climate change and what he wants to do in San Diego. “If we’re going to save our beaches in San Diego, we need to take our heads out of the sand, especially the tar sands,” he said, imploring the Mission Bay crowd to push President Obama to deny permits for the Canadian pipeline that is part of a massive proposed tar sand mining and pipeline project intended to deliver bitumen slurry to Texas coastal refineries. Mayor Filner explained that every level of government has to take some responsibility for dealing with global warming and that San Diego can be a national leader in the use of alternative energy sources. Part of a nationwide protest, with the major rally drawing an estimated 35,000 people today in Washington D.C., numerous San Diego groups participated in the rally, cheering numerous speakers, waving banners and hoisting protest signs. Major organizers locally were sandiego350.org, Citizens Climate Lobby, the Sierra Club, the Environmental Health Coalition and Greenpeace. 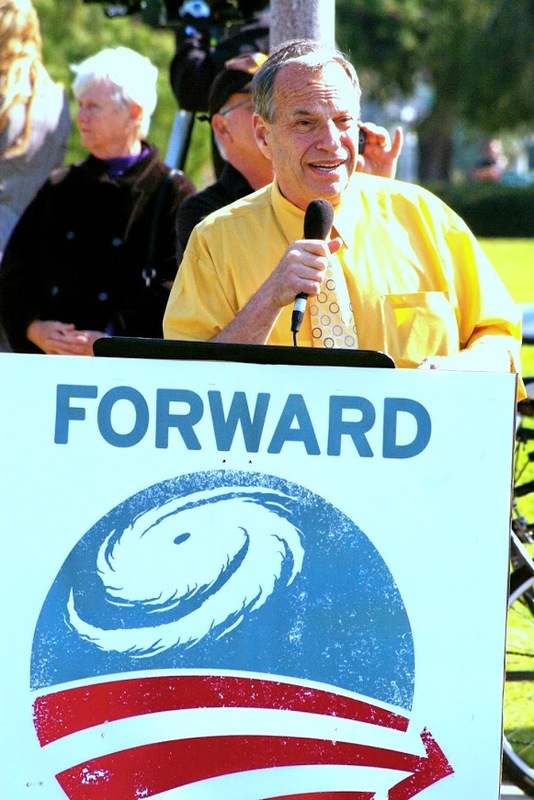 Also, speaking at the rally, Dr. Jeffrey Severinghaus, director for the Scripps Institution of Oceanography Climate-Ocean-Atmosphere Program, said there is an abundance of misinformation about climate on the public airwaves making real climate science more needed than ever. About 98 percent of climate scientists and researchers around the world agree with Severinghaus that humans, and not nature, are the source for the additional CO2 that is causing global warming. He noted San Diegans should show support for a new bill bill to curb carbon pollution introduced this week by Sens. Bernie Sanders (I-Vt.) and Barbara Boxer (D-Calif.). “You need to let Boxer know you have her back,” he said about the new bill which has an estimated tax potential of more than a trillion dollars and would be invested in sustainable energy programs, with a large portion returned to taxpayers. Former State Assemblywoman and present Chair of the Executive Committee of Sierra Club, San Diego chapter, Lori Saldana, also spoke at the rally, offering her perspectives on Keystone and climate change. “We’re here today as part of a nationwide call for President Obama to step up to the plate and stop the Keystone Pipeline once and for all – and to begin implementing policies to reduce greenhouse gas emissions, something that California pioneered,” she said. High-schooler, Tierra Gonzalez-Hammonds (daughter of Lorena Gonzalez, labor leader and candidate for the 80th Assembly District), also spoke, addressing her concerns about her generation’s future in a heated world. Scientists expect the sea level to rise at least three feet by 2100 due to global warming caused by CO2 generated by our use of fossil fuels. This means that much of Mission Bay and the San Diego area will be covered in several inches of sea water at high tide, and we will have enormous areas subject to flooding during storms. Sandy beaches up and down the coast could be washed away, destroying property values, wildlife habitat and tourism. Key climatologists believe the exploitation of tar sands and our relentless release of CO2 will tip our planet’s temperature into a catastrophic nightmare, and unless action is taken now, they say the damage will be irreversible.